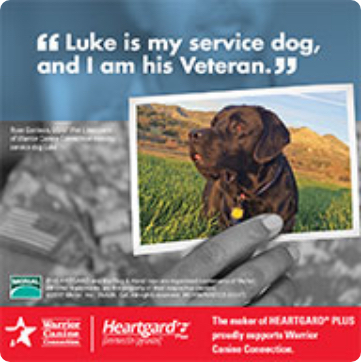 Warrior Canine Connection (WCC) is a non-profit mission that supports military service members, veterans and their families by harnessing the healing power of dogs to reduce symptoms of combat trauma. In WCC’s five-year history, the organization has benefited more than 3,700 men and women with highly trained mobility service dogs. By focusing on the dogs in their care rather than past trauma, WCC veterans are ableto take advantage of the program’s innovative “Mission Based Trauma Recovery” and begin reintegratinginto civilian life. Boehringer Ingelheim's sponsorship will include a contribution in support of WCC’s vision. Spread the word in your clinic! 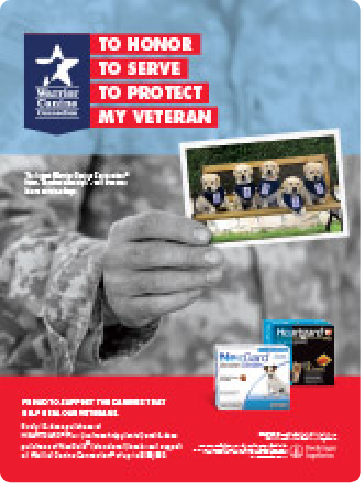 Print and display this informative piece in your veterinary office to educate pet owners on Warrior Canine Connection, and Boehringer Ingelheim’s commitment to the mission. Ask your Boehringer Ingelheim Sales Representative for more details.